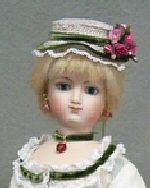 This is an adorable addition to our line of hats that we resized to fit Loulotte and smaller dolls with head circumference of approximately 5 inches. 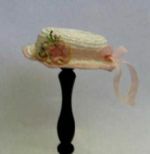 This is a very wonderful little bonnet for your antique or contemporary doll. It has a wide front brim that frames the face and it tapers into a brimless back. 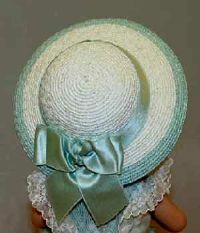 You may decorate with ribbon and flowers to coordinate with her costume. 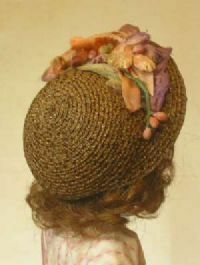 This delightful little hat has a rounded top with down-turned brim that is a little wider in the front than in the back beautifully framing the face. 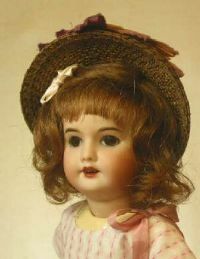 Fits Loulette or any doll with a head circumference of 5 inches. 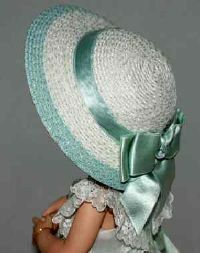 The design of this wonderful straw hat was inspired by the one used by Alice Leverett for one of her dolls. It fits the 12" Ultimate Fashion© dolls as well as Loulotte.